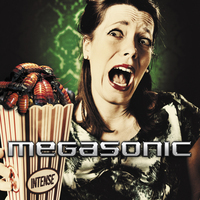 Belgian band MEGASONIC seems to consist of highly skilled musicians that have managed to elude me over the years. Formed quite recently they debut with an album described as echoing of VAN HALEN, OZZY, SAXON, SAVATAGE, WHITESNAKE, METALLICA... the list goes on and somehow such lists always make me worried. The album opens with a thundering intro that manages to squeeze in a bit of progressiveness. The spirited riff of “Bombs Away” is next, revealing only heedlessness and a rather blend easy going track that reveals nothing of the many bands mentioned as it is rather non-descript. The Latin rants of “Demon Lust” proceeds into another rather lukewarm track. “Witches Brew” sees them go into a heavier take on BON JOVI. They do everything seemingly effortless so I get the feeling they are holding back. But that also mean that they don´t fulfil their true potential. It is not until the slightly 80´s UFO-ish “Crash and Burn” that they offer up a really well arranged track with potential. All the way the solos are the best parts and they seem very prone to great choruses. I think I get a better picture of them in the PAUL GILBERT cover “Down to Mexico”. First up they get a strong material to work with, they do it well and really get the patented guitar player into their sound. MEGASONIC debuts ok, but I have a feeling this may not be the right vehicle for any of these musicians.